1. We are maintaining a waiting list and expect that a number of people on the list will be able to get a reservation at the Gaylord. If you have not already done so, please click here to be added. Please note, however, that we highly recommend that you also make reservations at an alternative hotel, in the event that we cannot get everyone on the wait list into the Gaylord. 2. We are working with the hotel to identify reservations that have ben made but will not be used. We expect some of these rooms to be released on Sept. 4. 3. We are working to secure another overflow hotel to provide a third option for our attendees. Additionally, there are a number of other hotels in close proximity to the resort that have availability. Please visit the PestWorld Web site for more information. We are committed to ensuring that every PestWorld attendee has a positive experience and will continue working diligently on this. If you would like help or would like to discuss this, click here or call us at 800-678-6722 and we'll get you to the appropriate personnel. If you have high quality – 300 DPI minimum resolution - images of your team at work, send them our way! We will include the pictures and your company¹s name on a rotating banner on our home page! Have you registered for PestWorld yet? Registration fees increase on Friday! Register today and ensure you take full advantage of the early bird discount rates. 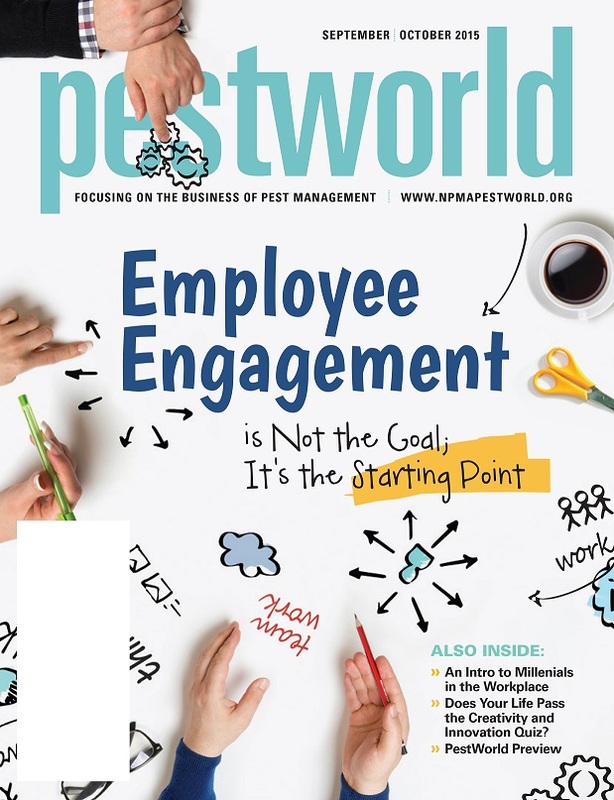 In this issue of PestWorld magazine, this year’s keynote speakers from both Academy and PestWorld keynote speakers address the topic of Employee Engagement. Does Your Life Pass the Creativity and Innovation Quiz? Nominations for NPMA's Young Entrepreneur Award, sponsored by Rentokil, recognizing pest management entrepreneurs (40 years of age or less), and the Women of Excellence Award, sponsored by Target Specialty Products, recognizing outstanding women who have advanced the pest management industry are being accepted until 5 p.m. ET on Sept. 8, 2015. The past few months have been pretty exciting for NPMA’s staff. In early August, Alison Loughlin joined the team as its membership marketing manager. In this role, Alison will provide marketing assistance to the state associations managed by NPMA as well as work with the membership and marketing team to create and implement marketing strategy focused on growing and retaining the membership. Additionally, several staff members received professional designations this year. Both NPMA's COO Dominique Stumpf and Vice President of Marketing, Communications and Membership Janay Rickwalder received their Certified Association Executive credential – the highest designation for association professionals. Director of Meetings and Exhibits Alexis Wirtz received her Certified Meeting Planner designation – the badge of excellence in the meeting, convention, exhibition and event industry. Welcome Alison and congratulations to Dominique, Janay and Alexis! Optimizing your fleet with graphics that continuously build and reinforce your brand is the most cost-effective marketing available and choosing a graphics manufacturer is no easy task. When it comes to selecting a partner able to uphold your brand standards ensuring your professional appearance, nobody manages the execution of graphic programs better than SignZoo. As an NPMA member, you'll leverage your buying power, getting the best product and warranty available, for the best price. Contact NPMA@signzoo.com for more information. Interested in seeing all of the programs available to you as a member? Check out the member benefits page at http://npmapestworld.org/membership/benefits.cfm. 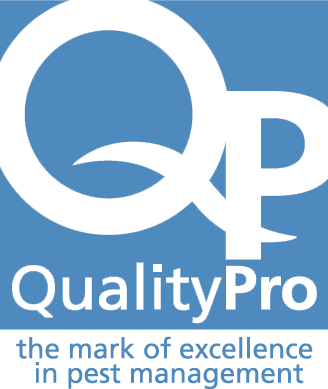 QualityPro encourages commitment to continuing education. Each QualityPro certified company is eligible to receive $100 per year (7/1/15-6/30/16) towards development in the field of entomology. To learn more, visit www.npmaqualitypro.org/benefits. Dr. P.A. 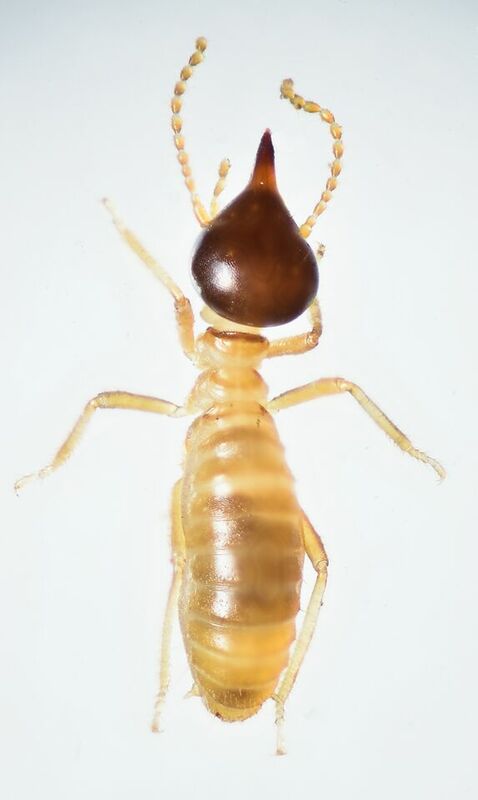 Eliopoulos, of the Technological Educational Institute of Thessaly, Greece, led a research team that investigated whether acoustic emissions produced by common stored product beetles inside masses of wheat can reliably be detected. A piezoelectric sensor and acoustic amplifier were used to measure acoustic emissions and predictions were made about the number of beetles per kilogram of wheat mass. This method was very effective and accurate in identifying 1-2 stored product beetles per kilogram and future evaluation of this technique may yield a fast and non-destructive method for determining whether stored products are infested with beetles. This paper was published in the August 2015 volume of the Journal of Economic Entomology under the title, "Detection of adult beetles inside the stored wheat mass based on their acoustic emissions." Last week, NPMA staff attended and participated as speakers at the 2015 Association of Structural Pest Control Regulatory Officials (ASPCRO) annual conference. The meeting opened with a presentation by Dr. Jerome Goddard of Mississippi State who spoke about the vital role of pesticides and Susan Lewis, the director of EPA¹s registration division. Session topics throughout the week focused on pollinator protection, applicator certification and training, benefits and risks of pesticides, invasive species and a special session on Golden Malrin Fly Bait (methomyl). At the ASPCRO business meeting, John Scott from the Colorado Department of Agriculture and 2015 president of ASPCRO passed the torch to incoming president Liza Fleeson with the Virginia Department of Agriculture and Consumer Services who will now serve in the role for the next two years. We thank all the NPMA members who were in attendance and all of the conference sponsors for assisting in making this important event possible. Next year fellow PCO Bob Dold, Jr will be defending his congressional seat in one of the four most closely contested races of the 2016 election season according to the latest analysis from the Cook Report. As we’ve done in the past, NPMA will be leading the industry in an effort to come together and rally behind Bob, ensuring he has the opportunity to continue the great work he’s started in Washington, D.C. In an effort to provide a more intimate forum to catch up with Bob, NPMA Members are invited to attend a special event directly following the NPMA PesTech conference scheduled for Jan. 5-7, 2016 at the Marriott San Jose, California. This event is only open to members of NPMA's "restricted class," as defined by the Federal Elections Commission. For additional information, please email aarchitect@pestworld.org. On Thursday, Aug. 27 a federal judge in North Dakota granted an injunction blocking the implementation of the controversial Waters of the U.S. Rule (WOTUS). 13 states are parties to the suit against the Environmental Protection Agency (EPA), while the injunction was granted only hours prior to the WOTUS rule going into effect on Friday, Aug. 28. The thirteen states where the injunction has immediately gone into effect include: North Dakota, Alaska, Arizona, Arkansas, Colorado, Idaho, Missouri, Montana, Nebraska, Nevada, South Dakota, Wyoming and New Mexico. While other states also filed complaints and injunctions about the rule, EPA said it plans to enforce the WOTUS regulation on the states not covered by the injunction. Other districts courts in West Virginia and Georgia declined attempts by opponents of WOTUS for injunctive relief. In all, there are 10 lawsuits against WOTUS representing 29 states, business interests, farmers and groups. The law suits are in several jurisdictions at the district and appellate level and both sides are attempting to consolidate the cases, with a high probability of this case eventually headed for the Supreme Court. The WOTUS final rule specifically includes language that would maintain the current status quo concerning the National Pollution Discharge Elimination System (NPDES). NPDES is a national permit program that regulates the point source discharge of pollutants and chemicals into waters of the U.S. The definition of WOTUS has expanded, but the traditional practices of PMPs have not changed. NPMA is continuing to lobby against expansive regulatory overreach like WOTUS and aggressively pushing for legislation like S. 1500 which would get rid of the duplicative NPDES permitting system. Successful companies grow fast and need to hire rapidly. With an influx of new recruits and increasing demands on the job, it's easy to let your latest hires just figure it out for themselves or to give them immediate tasks and focus areas. But before you let them loose, follow these tips to ensure they get productive fast. There's a burning question in the days leading up to this year's Burning Man: Who let the bugs out? And while that may seem like an ordinary question at the start of any Burning Man, this year it's particularly literal as early-arriving Burners photograph an apparent infestation ahead of the festival's start on Aug. 30, reports Business Insider. We already know that the world is built on connections. After all, it is about who you know and not what you know, right? With that being said, the busier you get, the less time you have to spend on unproductive meetings because, well, you’re busy working on revenue-generating activities. The tournament will be held on Wednesday, Sept. 9 at the Juniper Hill Golf Course in Northboro, Massachusetts. Click here to register. Click here to sponsor. After three years, Olof Sand hands over to Jarl Dahlfors who assumes the responsibility to develop and streamline the company further. On Tuesday, Sept. 1, Rentokil Initial PLC said it has agreed a USD425.0 million deal to acquire US-based pest control company The Steritech Group Inc.
Arrow Environmental Services has acquired Fort Myers-based Lan Mac Pest Control. The deal will significantly increase Arrow¹s service area in Southwest Florida and adds more than $800,000 in annual revenues. The acquisition follows several other recent Arrow deals in Southwest Florida, including mergers with Scotland Yard Pest Control in Cape Coral and Big Difference Pest Control in Naples. Butler Pest Control Services, Inc.
Virginia Pest Control Services, Inc.